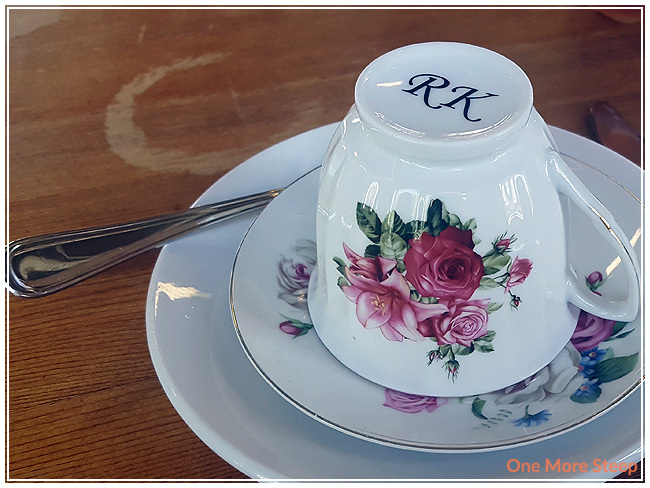 I went to the Honeybee Centre a few weeks ago with a friend for their afternoon tea. I think the last time I ventured into the Honeybee Centre was probably for some sort of field trip in elementary school to learn about bees and pollination. 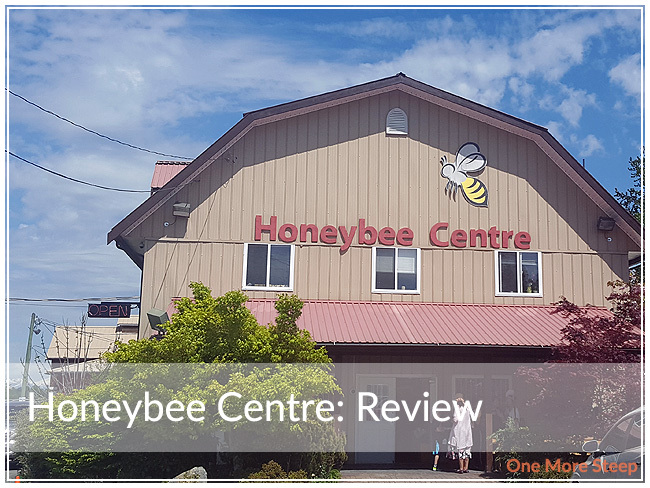 If you’ve never been to the Honeybee Centre, there are tours offered for school and seniors groups, a shop to buy all things honey, and their Beestro – where you can have afternoon tea or a more practical meal. Each table included a honey bear for all your honey sweetening needs – I quite liked that touch. The servers were friendly and enthusiastic whenever they stopped by the table. While I was there for tea, there was a very large (read: 3 large tables worth of people) party that was loud and did manage to take up a lot of the servers’ attention, as one might expected. There’s also an outdoor patio if you want to eat outside. 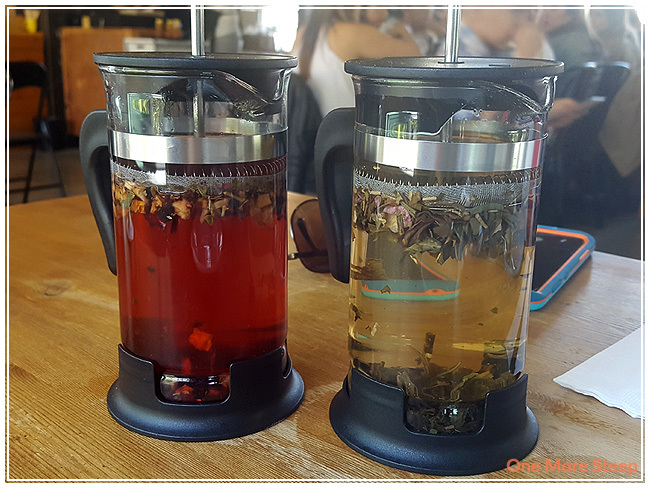 I usually opt for a black tea with afternoon tea, but because it was such a hot day when we visited, I wasn’t really feeling it. For my tea choice, I had Nana’s Fruit Garden, which is described as a “bright, flavourful fruit tea with berries, apples, and hibiscus” while my friend had the Blossom Organic Green Tea. Our teas came in French presses. Nana’s Fruit Garden steeps to a deep red. It has a lovely fruity sweetness to it, I could taste both apples and berries in it, and it had a touch of tartness from the hibiscus. Nothing a little bit of honey couldn’t fix! 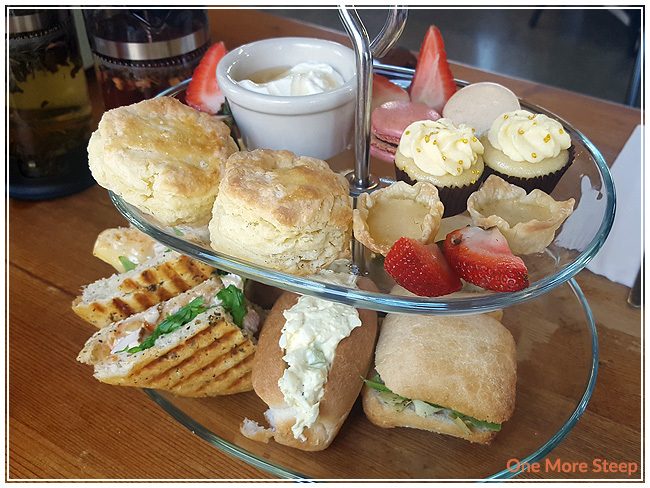 The afternoon tea goodies were placed on a two-tier stand. The bottom tier contained all the sandwiches. There was the chicken, brie and red pepper jelly panini (2 pieces per person), egg salad roll, and the artichoke ciabatta. I wasn’t blown away by the egg salad roll or artichoke ciabatta, but I loved the chicken, brie, and red pepper jelly sandwich. It was a delicious flavour combination. 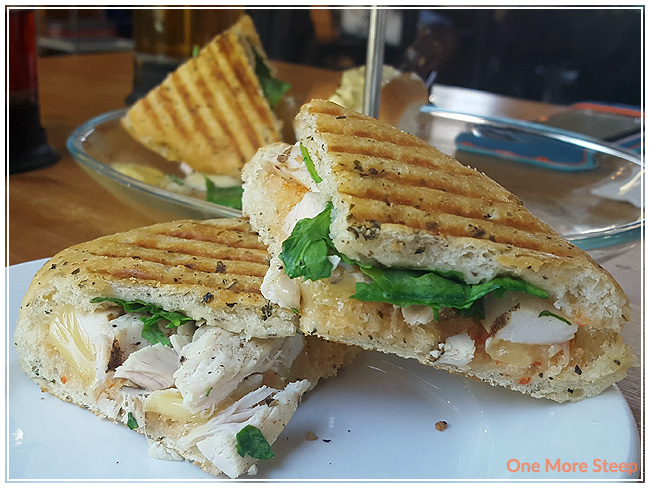 Chicken, brie, and red pepper jelly panini. The honeycomb scone was paired with a devonshire cream, which also had honey in the small bowl. The devonshire cream wasn’t as thick as I’ve experienced it before in other places, but it was tasty. The scone was really tasty, it definitely had a nice sweetness to it. 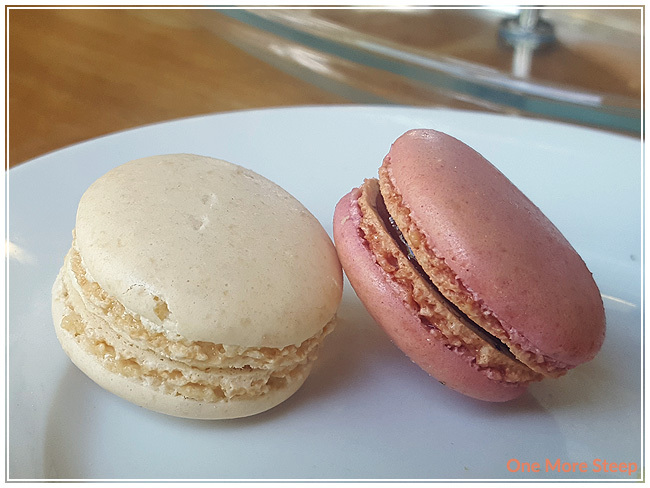 The sweets included French macaron (we received a strawberry macaron and what tasted like vanilla bean), honeybee cupcake, and salted honey tart. The salted honey tart had an alright tart shell, but the salted honey filling was divine. I’m not sure what they put in there besides salt and honey, but it made my mouth so happy to be here. 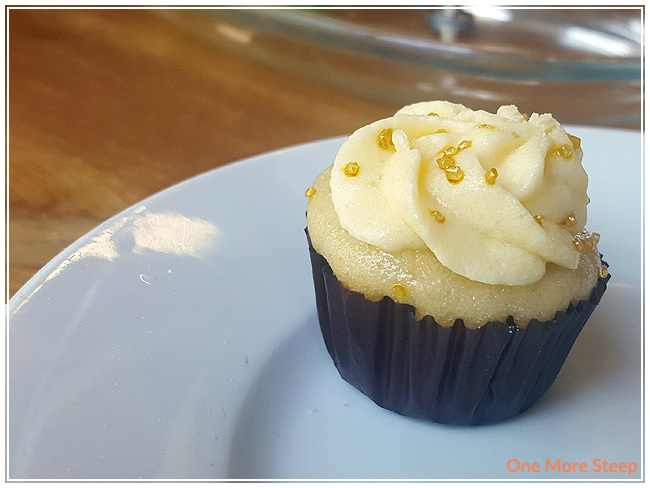 The cupcake was moist with a sweet frosting on top, and it had a great honey flavour. My friend and I wound up getting a knife to cut the macarons in half so we could each experience both flavours. My favourite was the strawberry, it had a very nice brightness to the berry flavour. 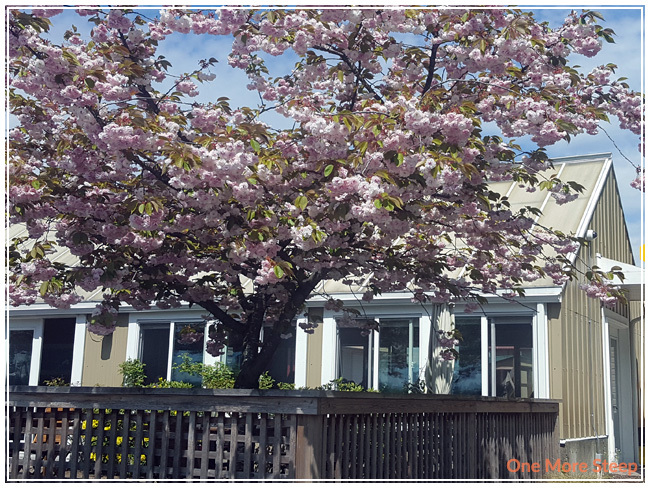 After the tea, we took some photos of the blossom trees, and shopped the gift shop – I picked up some honey and bee pollen (to help with my seasonal allergies!). There’s some beautiful blossom trees right out front, and I saw a lot of honey bees flying around! 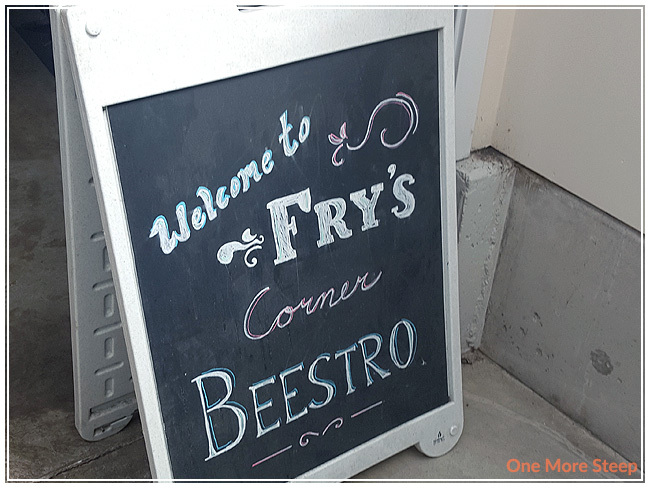 I had a really fun time with afternoon tea at the Beestro at the Honeybee Centre. The service was great and I really enjoyed the food. I think next time I go, I’d opt for a more traditional black tea with the afternoon tea service. It’s a fun location, definitely kid friendly if you opt to take any children with you. There’s honey facts everywhere, so you might even learn a little something.